Dark chocolate, heart-healthy or heightened hype? Delicious. Delectable. Decadent. Oh, how we enjoy chocolate goodies! The sweet treat is a palatable paradise. Valentine’s Day, Easter, Halloween—holidays oozing with multi-colored wrappers containing the exciting elixir. Chocolate hearts. Chocolate bunnies and eggs. Chocolate candy bars. Chocolate goes to the cinema. “Willy Wonka & The Chocolate Factory” is a popular book and movie with a chocolate theme. An eccentric chocolatier owns a magical chocolate factory and seeks an heir. Willy, a young boy with character, but living on the cusps of poverty is declared the winner. Roll out the Red Carpet for dark chocolate. But hold onto your bloomers as you learn more about the happy hype. How did the chocolate factories bamboozle consumers into believing that a yummy concoction of fat, sugar, and chocolate is a healthy snack—a health food? We know why—profit. When consumers buy into propaganda, they buy the product. Chocolate is big money. And big money carries power. And just how did the chocolate moguls fool the masses? Scientific research and advertising. Producers of chocolate paid for studies into cocoa science. Isn’t that a conflict of interest? Public perception is often bought and sold for profit—not for public health. Vox published a 2018 article investigating dark chocolate as a “superfood.” Journalist Julia Belluz reviewed 100 Mars-funded health studies. “In 1982, Mars Inc. — the company that has brought us M&M's, Snickers, and Twix — established the Mars Center for Cocoa Health Science in Brazil to study, in part, the biology of cocoa and its impact on human health,” according to Belluz. Around 70 percent of the world’s cocoa beans come from West African countries: Ivory Coast, Ghana, Nigeria, and Cameroon. In Asia, you’ll find cocoa beans growing in Malaysia and Indonesia. Brazil and Ecuador are also producers of cocoa beans. Cocoa is made from tropical Theobroma cacao tree seeds; the main ingredient in chocolate. Does dark chocolate contain enough of the flavanol micronutrient to justify eating the fat and sugar content that accompanies the yummy foodstuffs? Fresh cacao beans are rich in flavanols, but the micronutrient can get destroyed during chocolate processing. Not all forms of chocolate contain high levels of flavanols. And cocoa is a bitter-tasting powder—that’s why sugar is added. How much chocolate does a person need to consume in order to garner the flavanol benefits? Does dark chocolate really help protect your cardiovascular system? The top four countries responsible for the production of chocolate are the United States, Germany, Switzerland, and Belgium. According to the American Cancer Society (2019 article), “We do know that flavanols in cocoa beans, an ingredient in chocolate, are antioxidants, meaning that they may reduce damage to cells. Damaged cells can lead to cancer development. What we don’t know is to what extent chocolate itself has an effect. There have been a number of studies done on the health benefits of chocolate, but these studies mostly asked people to remember how much chocolate or chocolate products they consumed, then compared it to whether or not they’d had heart problems or cancer. So, while the results of these studies are interesting, they really don’t tell us if it’s the chocolate itself making a difference, or if it’s the flavanols, which can also be found in other foods.” www.cancer.org/. Some foods rich in flavanols include cranberries, apples, blueberries, plums, cherries, oranges, strawberries, peanuts, onions, legumes, spinach. 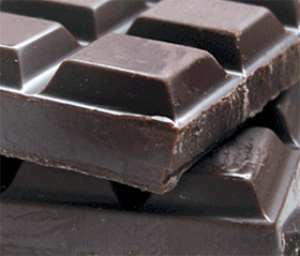 Does dark chocolate improve cardiovascular risk factors? It depends on the study. Of course, reputable health professionals and scientists recommend more research to find the answer. Hershey, Nestlé, Cadbury, Godiva, Ferrero, Whittaker's, Ghirardelli, what say you? So, is dark chocolate heart healthy or heightened hype? You decide. Nonetheless, the answer is moderation. The answer is to eat well-balanced meals. And enjoy a dark chocolate yum-yum occasionally—because chocolate is candy. Sorry to burst your dark chocolate bubble, but use your brain instead of your taste buds. Dark chocolate is a treat and not a health food. Anyway, you will find me munching chocolate peanut butter eggs during Easter and chocolate peanut trees during Christmas. And dark chocolate treats throughout the year. Bon appétit! Buon appetite! Buen provecho! Melissa Martin, Ph.D., is an author, columnist, and educator. She lives in US. This author has authored 38 publications on Modern Ghana. The Same Beginning -What Happened? Mercy Killings Or Playing God?